In analyzing the site traffic here I have noticed people searching Yahoo and Google recently for "La Sirena Grill Irvine." There is no La Sirena Grill in Irvine so I thought at first that people didn't know it's really in Laguna Beach. But after I saw that numerous people were searching for the same thing I decided to look into it and found out that there really is a La Sirena Grill coming to Irvine. It will be part of the new Orchard Hills Village Center on the north-west corner of Culver Dr. and Portola Parkway. We will try to give notification here when it opens for real. For now, you can read our review of the original La Sirena Grill in Laguna Beach. Went to my dentist earlier today and in the discussion that ensued I found out he had been to this new La Sirena Grill location so a couple hours later I went for an early dinner. Here's a few pictures from my visit, showing their nice outside dining area, their menu boards, and the taquito plate I ordered. Was contacted recently by Kathy Nguyen at The Orange County Register asking if I would like my site profiled in the paper. We agreed to meet over Mexican food, and since I've been meaning to get to the Mexican ice cream store known as La Nueva Reyna de Michoacan after reading about it in the OC Weekly, and knowing it was close to the Register offices Kathy and I agreed that it'd be fun to talk over some ice cream. I arrived before Kathy did and waited for her to show up. When she did we both went in and started talking with the lady working there who was very nice but was reluctant to allow either of us to take pictures. Kathy and I then stepped outside to figure out what to do. She said that perhaps I looked like a stern health inspector or some other intimidating official sort of person. In my jeans and Hawaiian shirt I thought I looked pretty laid back but guess that just made me look like a health inspector in disguise. Since neither Kathy or I knew very good Spanish (although Kathy's has excellent Spanish pronunciation) she decided to call for some bilingual backup from the Register. She was able to get someone fluent in Spanish on the cell phone then handed the cell phone to the woman behind the counter to explain to her that we were friendly visitors there who meant no harm. The woman understood the explanation she got over the cell phone and eased up and explained to us all the frozen treats they serve. I had heard the guava ice cream was good but found out they didn't have any when I was in. One ice cream flavor they had that I never knew existed as an ice cream flavor was cottage cheese. I sampled that and it just tasted like extra creamy, extra rich vanilla ice cream with a slight cheesy velvet-like texture to it, smooth not curdled. The only other kind I sampled before settling on a purchase to make was the cinnamon ice cream which was good and "cinnamony" but I couldn't really imagine eating a whole cone full of it. I finally settled on one of these paletas, a fresh fruit popsicle, basically, that are made and packaged on location and sold there and maybe even sold elsewhere outside of the store. I ordered the creamy strawberry popsicle that had a huge frozen strawberry almost falling out of the bottom and leaving very little of the popsicle stick left for me to grab onto. I wasn't complaining though. On a hot day this refreshing treat was exactly what I needed. The writeup on this is supposed to be appearing as the lead article in the Life section of the Register on Monday, July 2, which will focus on several other food-loving people as well. I don't know exactly how the article is going to turn out. I was asked if I wouldn't mind having my picture taken for it. I struggled with how to handle that since, according to the 300-yr. old Food Bloggers Code Book, my appearance should be kept secret but at the same time I didn't want to reject the request. My solution was that maybe I could have my picture taken in such a way that readers would get some idea of what I looked like while still leaving me mostly unrecognizable to owners of restaurants I might visit in the future. So when the actual pictures were taken my best attempt to disguise myself was to put my sunglasses on. And maybe they'll use a picture with my back turned to the camera. At least I'll never be able to wear that same Hawaiian shirt to a Mexican restaurant again. This is the casual sit-down restaurant at the Maui Ocean Center, which is like a smaller version of Long Beach's Aquarium of the Pacific. I got some fish tacos. Pretty standard stuff. Here's the picture I really wish I had my digital camera for. This is the Grape and Brie Quesadilla from the Hali'imaile General Store in upcountry Maui, served with basil pesto and sweet pea guacamole. Even though it's called a "general store" it is actually a restaurant in the spot of an old general store. They sell a cook book you can get from Amazon with a few exotic, Mexican-inspired recipes such as "Asian Pear and Duck Tostada." They are like a cross between a Rubio's and a Taco Surf and they had one of the most varied salsa bars I've ever seen. The mahi mahi fish tacos I got were good but I'm not sure if they should be award-winning. I'll be going back though, if only to try their macadamia nut flan I saw listed on their menu board. Compadres Taqueria serves food to mallrats and has a sitdown area and a takeout window. I went to the takeout window and ordered a seafood chile relleno and chicken enchilada. Then I went to the Orange Julius in the same food court there in the Lahaina Cannery Mall and got a strawberry julius to drink. The food was serviceable but not quite appealing enough to finish off, especially when I saw that my chile relleno was microwaved. One night after a busy day I went back to my hotel room and ordered a Kahlua Pork Quesadilla from room service and watched Deja Vu starring Denzel Washington on Pay-for-Play. Kahlua pork is pretty much the Hawaiian version of Mexican carnitas. The Maui Tropical Plantation is a large botanical garden in Waikapu that you can take tram tours of. They have a restaurant and gift shop on the grounds and you can also find a hut on the grounds that has a TV/VCR set up inside with a videotape constantly looping that tells the story of C&H Sugar. Does anyone else remember their old commercials from the 1970's? There's also a lagoon area (pictured above) that could be called Edenic. So, that's my report on Maui Mexican food. Until I return and try some more, that is . . . Stopped by Gabbi's Mexican Kitchen on the Orange Circle today for lunch. I go roughly once a month and they generally seem to have at least one new item every time I go. This time they had an excellent Quesadillas de Huitlacoche. This was recommended to me by their co-owner Ed, whose wife Gabbi was very busy being the new up-and-coming celebrity chef. I talked more extensively with Ed than usual this time and he explained that huitlacoche is a sort of Mexican truffle that grows on ears of corns. It destroys the corn it grows on but sells for considerably more than corn so the corn farmers don't mind too much if their corn gets attacked by this fancy, delectable mushroom. This dish is served as an appetizer with melted cheese in two corn tortillas in a poblano crema sauce. VERY IMPORTANT NOTE: This review (Tortilla Jo's - Review #2) is only of their takeout window. We also have reviews of their sitdown service. 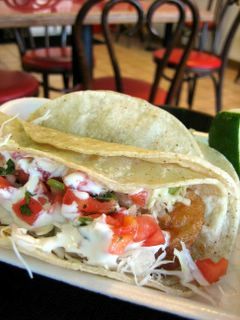 CLICK HERE for our complete Tortilla Jo's coverage. A lot of the complaints I've seen about Tortilla Jo's at Downtown Disney center on the typically long wait (although I have had good luck a couple times there). If you get there and you find there's going to be a long wait you might want to consider going to the take-out window around the side of the building. It has an abbreviated version of the sit-down restaurant's menu but also has a few items that the sit-down section doesn't have. Case in point: the "Mexicone" I got yesterday served in a crisp corn tortilla shell that has been twisted into an ice cream cone shape. 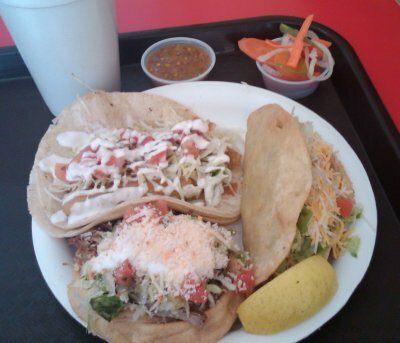 It comes stuffed with beans, rice, onions, cilantro, and cheese, and your choice of meat (or no meat, if you prefer). 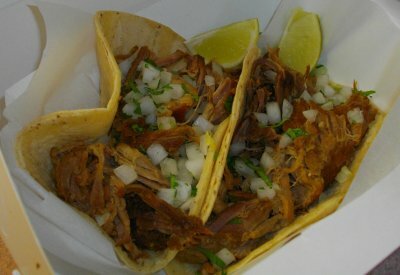 I chose the shredded pork which tasted a lot like the crispy carnitas from El Farolito Jr. I don't know if you're supposed to walk around enjoying your Mexicone in the heat of the summer day since it's in supposedly transportable form. It might've been my ineptitude but I had to sit down and eat it while it crumbled all over the place. That doesn't mean it didn't taste good. Surprisingly enough they also sell horchata, tamarindo, and jamaica aguas frescas, but, unfortunately, they are steeply expensive at $3.75 a glass. My guess is that this precludes many visitors from even trying it out and opting instead for a standard soda, which, of course, is still too expensive when you are at Disneyland, but at least cheaper than the aguas frescas. The takeout window doesn't validate your parking ticket but you can go into the entrance of the sitdown section and show them your takeout receipt and they will validate your Downtown Disney parking ticket. Since I had seen an ad before that showed that Tortilla Jo's Taqueria sold frozen fresh fruit popsicles I asked during this visit if they had those and the girl at the window said they used to but don't anymore but she wished that they still had them. They do sell flan, churros, and brownies for dessert though. Earlier this month Irvine-based El Pollo Loco introduced its barbecue chicken flavor to be available for a limited time only (until September 4). This flavor is utilized in El Pollo Loco's traditional chicken dinners as well as a BBQ Ranch Chicken Tostada Salad and a BBQ Chicken Quesadilla. The full description and photo of the salad can be found in the recently updated Salad Wars entry here. Be sure to check out the Monster Munching blog, which covers all types of restaurants in Orange County. A little over a year ago, back in the Roundup #4 entry, I mentioned that a waiter at Black Sheep Bistro in Tustin said that one of his favorite Mexican restaurants was El Zocalo Mexican Steak House in Santa Ana. The mere fact that I made that mention means that anybody searching on "zocalo" is likely to find my blog in their search results, but then come here and not actually find any information on it . . . until now. This should show anybody that's ever made a recommendation to me that I follow up on all recommendations I get . . . even if it takes a year or more. In a location that used to be the Ancient Mariner restaurant in the 70's and several other restaurants since then, El Zocalo looks a lot like the Chili Pepper in Orange with more earth tones, less primary colors, and lots more jungly overgrowth. The tiki torches in their courtyard don't exactly further the Mexican theme but I'm not complaining. I went for the chicken enchiladas in mole (pronounced "mow-lay") sauce, served with rice and beans and a little bit of salad fixin's that I probably should've asked for some dressing for. This was quite likely the hottest mole sauce I've yet experienced. Bitter, hot, and chocolatey: from reading it it might not sound so good but when you taste it your taste buds will counteract your mental reasoning on the matter. Seeing as how Rhett and Matt actually have things called "jobs" that they had to get back to I was the only one left to enjoy dessert, the bunuelos with ice cream which ended up being a lot like the deep-fried ice cream that Azteca's in Huntington Beach serves but without the ice cream being deep-fried, if that makes any sense. These were six fried, sweetened tortilla wedges all pointing at two scoops of ice cream, everything drizzled with strawberry sauce with a mint leaf, whipped cream, and a cherry on top.